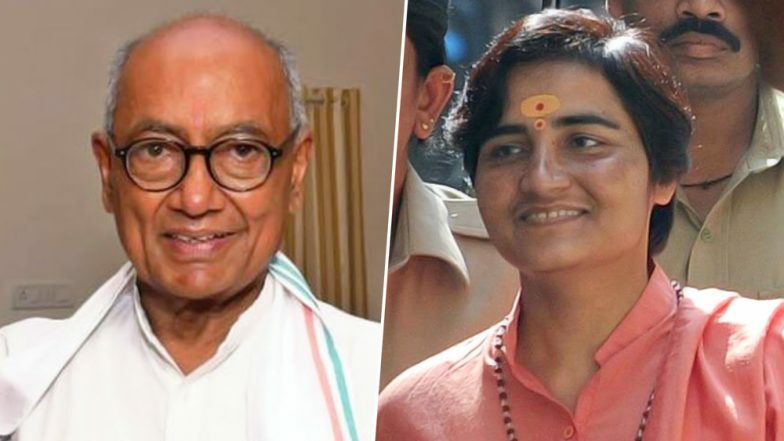 Bhopal, April 17: Sadhvi Pragya on Wednesday formally joined the Bharatiya Janata Party (BJP) and is likely to contest from Bhopal Lok Sabha constituency against senior Congress leader Digvijaya Singh. While speaking to news agency ANI, Sadhvi Pragya exuded confidence of getting a ticket from Bhopal. She said, “I have formally joined BJP, I will contest elections and will win also.” The saffron party, so far has not announced any candidate from Bhopal. Speculations were rife that the BJP might field Sadhvi against the Congress stalwart. Earlier speaking to The Times of India, the Hindutva leader while referring to Singh had said, “I am ready to defeat the enemy." The senior Congress leader was a staunch critic of Sadhvi. In March, Madhya Pradesh Chief Minister Kamal Nath announced that Singh would contest the general elections from Bhopal. Sadhvi Pragya was accused in the 2008 Malegaon blasts. Bhopal is a bastion of the BJP in Madhya Pradesh as the party has been winning the seat continuously since 1989. The last Congress MP elected from Bhopal was K N Pradhan in 1984. In 2014, Alok Sanjar of the BJP won the Lok Sabha elections from Bhopal defeating Prakash Mangilal Sharma of the Congress. This year, the polling in Bhopal will take place in the sixth phase on May 12. The last date of filing nomination on this seat was April 16. The last date for withdrawal of nomination is April 24. Meanwhile, the parliamentary polls in Madhya Pradesh will take place in four phases on April 29, May 6, May 12 and May 19. The results will be declared on May 23.